CITRUS HEIGHTS, CA (MPG) - March 31, 2018 was a day of browsing through Citrus Heights history for the nearly 300 who visited the 102-year-old Rusch Home located at 7301 Antelope Road. Guests represented generations of long-time Citrus Heights residents, many having watched their city grow from a small farming town to becoming part of Sacramento County’s Central Township in the 1850’s to finally becoming incorporated as a city on January 1, 1997. Now it is an up and coming city with a population of over 87,000. Everything from a resident of 80+ years to a new transplant would want to know was held within the walls of this 1,700 square foot home, surrounded by hundred-year-old heritage oaks, shrubs and heritage rose bushes. History unfolded before them in text and photos on 20 large colorful history display panels and in a 16-minute silent black and white film. Donated to the city by the estate of Maurice Rasmussen, who was in charge of public relations for the Chamber of Commerce when it was started in 1958, the video is a traveling journey to 20 locations which still exist, along with the visual stories of people and organizations. Reliving step by step each turning point, milestone and highlight of the city’s history, the panels and film evoked many inquisitive and reflective moments. Parents also explained to their kids and grandkids that this is where they were raised and what they had experienced in the “olden days” of Citrus Heights. Some belabored of those good old days when Greenback was just a two-lane road lined by huge trees. 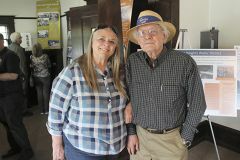 Larry Fritz, president of the Citrus Heights Historical Society, wrote the text for the assorted panels which were designed by volunteer Christine Stein. One of the panels that drew the most interest was of the first shopping center in Citrus Heights; the Mariposa Shopping Center off of the old US Highway 40 on Mariposa Avenue. It shows a Texaco gas station, Hall’s Groceries and Meats, Hall’s Furniture and Appliance, Pay-Less Cleaners, the Doughnut Den and the town’s first post office. In the Rusch Home itself the kitchen’s large white sink and black and white checkered counter and floor are original with functional appliances. Even though all the original furniture was removed when the home was donated to the county, all present furnishings are authentic period pieces and do not deter from the historical feel of all the rooms. Each room held new surprises and interesting facts. One panel explained how Citrus Heights got its name, revealing that the new town was not actually known for citrus, but that the name was a marketing strategy by Alfred Trainor of the real estate company, “buying up and selling large tracts of land in the Sylvan District.” Other panels depicted the history of Mitchell Farms, the 160 acres surrounding Greenback Lane and Sunrise Boulevard and the Brown Farm, which was one-third of the Volle Ranch left to Emma Rusch, the youngest daughter of Herman and Louisa Rusch, who married Americus Brown. Other informational panels on displaye featured the Rusch House, San Juan High School, Friends Church, Sylvan School, Sylvan Cemetery, 14-Mile Roadhouse and Citrus Heights Water District. The milestone that had the most impact was likely the progression of the city’s changing infrastructure, from the creation of the unpaved Lincoln Highway in 1913, to 1927 when it became Highway 40, to the 10-lane freeway that it is today. History Day is sponsored by the Citrus Heights Historical Society. The Historical Society was formed in 1991 to preserve and promote the history of Citrus Heights. While it has been inactive in recent years, the Society is now working with the Sunrise Recreation and Park District to promote local history and the Rusch Home. For more information, please contact Larry Fritz at 916-802-7241 or visit www.facebook.com/CHHistorialSociety.